These 39 mm diameter casino sized chips are 11.5 grams in weight. All 10 colors are produced from a composite resin and an insert that gives them the weight and feel of a heavy casino quality chip. These feel authentic and professional. Ready for denomination or customization with our in-house hot stamp capabilities.The detail on these chips is great. "Holdem Poker" adorns the each surface around the chip, with card suits embedded along the chip's edges. Four edge spots in white (blue if the chip is white) add excitement to the design. 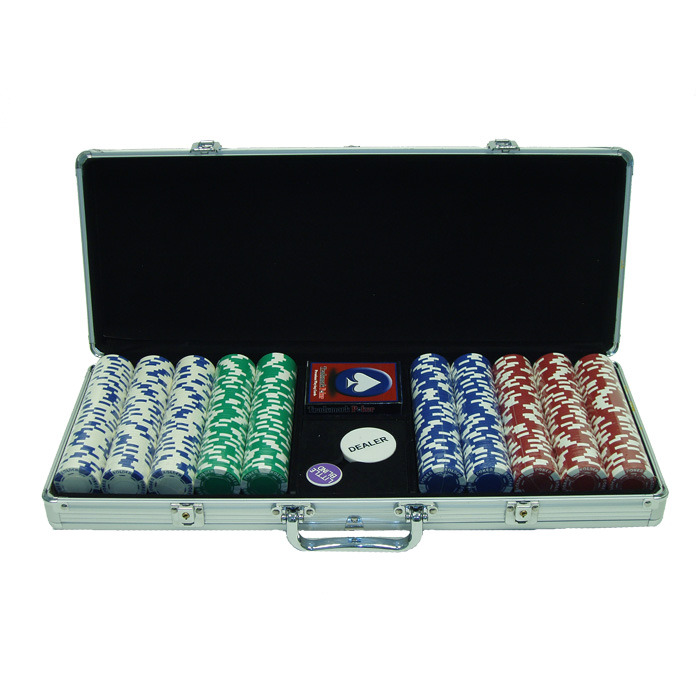 Affordable and colorful, these chips are perfect for home poker tournaments. This unique design is great for casinos and homestyle play alike. Your Chips will be protected in this aluminum case. It will provide the most protection for your investment. It is made of heavy duty, yet lightweight aluminum available in brilliant silver. The interior is black velour with space for 500 chips, 2 decks of cards and 3 buttons. The handles are are securely riveted for long lasting use. The color and quantity of chips shown are the most popular and have been pre-selected for you, however, you can make changes per your requirements.